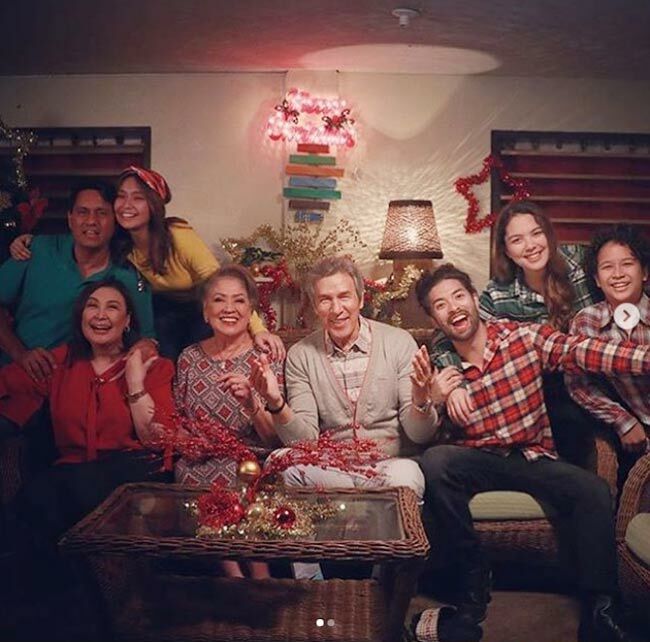 Three Words to Forever stars (L-R, right frame) Richard Gomez, Kathryn Bernardo, Sharon Cuneta, Liza Lorena, and Freddie Webb. In Three Words to Forever, three couples face one question: what do they need to say to each other in order to have a lasting relationship? Are the words "I love you" enough? The latest Star Cinema movie stars Kathryn Bernardo as Tin, a bright young woman who works in New York. Viewers first see her packing her bags to go back to the Philippines, so she can attend the 55th wedding anniversary renewal of vows of her grandparents Cito (Freddie Webb) and Tinay (Liza Lorena). Tin is inspired by her grandparents' long-term commitment, which is why she made her boyfriend Kyle (Tommy Esguerra) tag along. 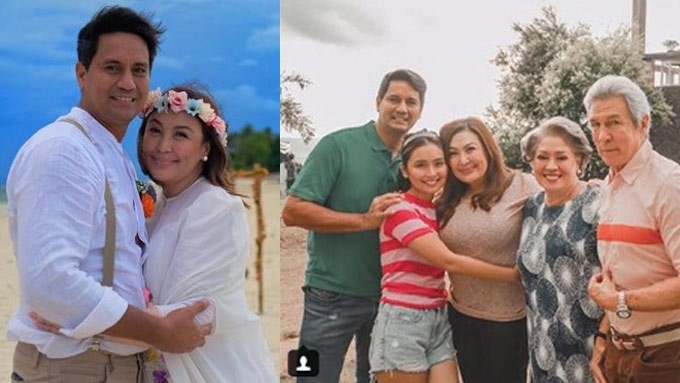 Little does she know that her parents' relationship is on the verge of breaking down, as Ric (Richard Gomez) has verbally expressed his decision to finally leave Cristy (Sharon Cuneta) after 25 years of marriage. Three Words to Forever triumphs mainly because of its well-written characters. Director Cathy Garcia-Molina made sure that the characters have chemistry as a family, and so it is easy to relate to their story. They are all believable as a real family. Kathryn imbibed her character with an eagerness that's charming but not grating. Sharon was able to show misery masked by strength, while Richard Gomez communicated a lot, even through his silence. Freddie Webb and Liza Lorena are reliable, as expected. Even Tommy Esguerra, a model from Pinoy Big Brother 737, was able to act well as Kathryn's prudent boyfriend. Who knew? Because the actors' performances are so strong, it is easy to empathize with their pain. The emotional climax of the movie just might move viewers to tears. 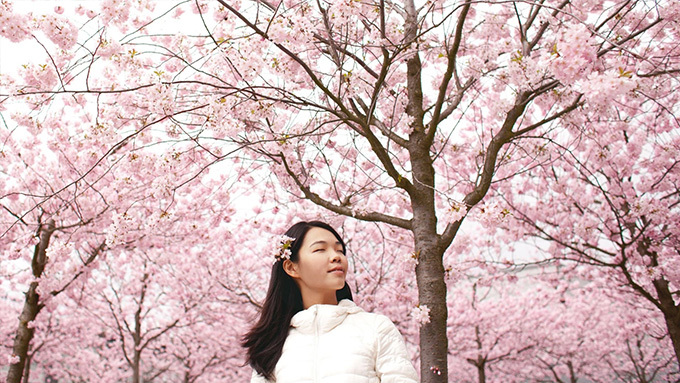 Three Words to Forever isn't perfect, despite its strength in the acting and storytelling departments. Its visuals are flawed. Majority of the film is shot in the picturesque hills and valleys of Ormoc in Leyte, but these scenes were only shown as establishing shots. A lot of moments happen outside, and it is quite perplexing why the chosen shots are close ups. Even worse, the background looks blurred and artificial in these close ups. Three Words to Forever's message is that what matters more in a relationship are the words that are often left unsaid. "I love you's" are not enough, especially if you are holding yourself back from speaking about your true feelings. Honesty is important in a relationship. You have to communicate your inner thoughts so that they won't grow into resentment. Sure, you might always tell the other person that you love them, but do you also say how you get hurt by the things they do? Perhaps "I am sorry" is a more essential statement that can lead to forever than "I love you." Directed by Cathy Garcia-Molina, Three Words to Forever is Graded B by the Cinema Evaluation Board. Ed's Note: The "PEP Review" section carries the views of individual reviewers, and does not necessarily reflect the views of the PEP editorial team.